One-time fee for full source Code. Optional hosting includes support. 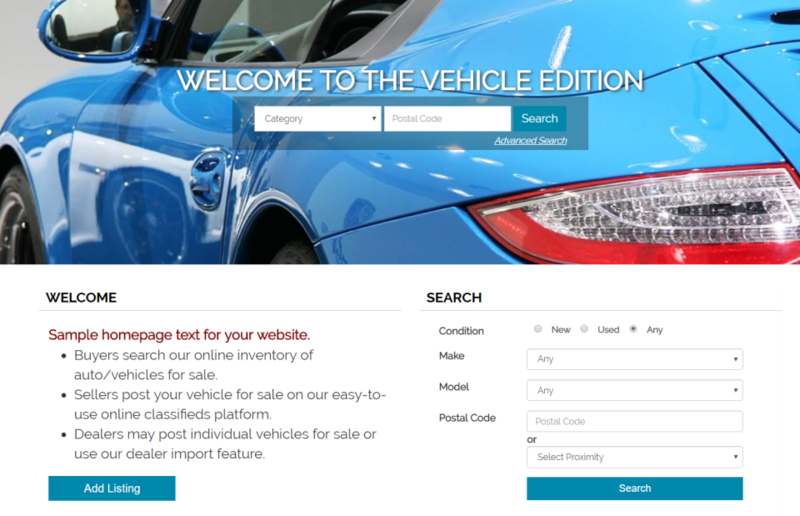 MarketGrabber Vehicle Classifieds Software provides you with a powerful platform to launch a search engine friendly, responsive website connecting buyers with sellers and/or dealers. Use our dealer import add-on to bulk upload cars and vehicles from dealer inventory management systems. Provide your customers with an easy-to-use platform and earn revenue with unlimited pricing plans and banner advertising. Made in the USA. Full source code included. MarketGrabber Classified Ad Reviews Recently Reviewed! Market Grabber software is feature rich, EZ to use, scaleable, works as advertised - a great value. Pros: The Vehicle and Classifieds editions I use come already loaded with vehicle makes and models, a nice layout and easy setup. Someone starting new with a classifieds website can add their logo, make some color changes, set up email and payment functions, and get started the same day. I did something like that with two earlier purchases of MG software licenses. The big test would be this year for my mature website (13+ years), my main source of revenue. I asked MG for many customizations to the display area in order to more closely resemble what my customers are accustomed to, and they came through. There are already many built-in features we did not have before, like easy social media posting, saved searches, photo uploading with resizing, customer log-in access to their listings for updates, and more. The software has passed the test; my customers adopted the new way and appearance and in our second month of the rollout we are approaching a new high in volume during what is historically a slow month. A record month without my usual large time investment? Yes. In my former website, where more business also meant more work, there were too many things that I had to do manually. I can't believe how much my work/life balance has improved - no more late nights tinkering! I suddenly have free time again. Business growth is not hindered by the time constraints of working IN my website when I should be working ON my business. What a life changer for me. Cons: I am so used to doing everything myself that I sometimes think I would like more ability to make customizations to pages, like change the layout, create special text boxes, link placement, etc - but when I come to my senses (LOL) I realize that kind of thinking defeats the purpose of the automated features Market Grabber offers that free up my time to work on growing my business. I understand why users are limited in what we can do on our own without a strong grasp of ASP and HTML, and that's OK, I don't want to break something. What more can I say than this: I am already planning my next purchase of Market Grabber software. Overall: It does things automatically that I used to have to do manually, and it does not place an upper limit on my much business I can do because there are only so many hours in a day. Thank you for the awesome review Tom, we are happy to hear your customers are adapting to the new environment. You have a great niche site and we wish you much success. Very cost effective for my business model and allows reasonable customization for a nonexpert. Pros: Easy to make changes, professionally designed and easy to customize for my business. The administrative and support team have been terrific and very responsive any time I needed help. Cons: After having my site set up for about 8 months I honestly can't think of anything that I would consider to be a "con". Overall: What I wanted at a reasonable price and responsive, professional, friendly support team. Thank you very much for the positive review Jim! It's a pleasure to work with you and we wish you much success with your new website! This product has really been amazing! Ease of use and easy to learn. Pros: I like that we can make changes if needed. I like that the level of customer support has been over the top! Thank you very much for the positive feedback Jeremy, the entire team appreciates it! Wishing you much success with your new venture!